SISU snus offers an intense and tasty experience that is guaranteed to wake you up. This snus lies in between budget and premium but can possibly be best described as quality snus for a good price. With a box of SISU you get to experience a piece of Finland, with all its power and splendour, concentrated in a portion that fits perfectly underneath your lip. SISU Snus is produced by the company AG Snus, and they are also famous for products such as Kapten, Hop(e) & Glory, Blue Ocean and Crafted Snus Whisky. Through a whole new processing technique used in the production of SISU, the company has developed a specific portion snus that is not only strong, but also has a new design with a cool fit and feeling. Some have described the portions as Soft White Dry, which means that the white packaging is both soft and comfortable, and you still feel the same nice effects of the snus in your body. The name SISU could not be more fitting for this type of product. Sisu is Finnish and can be translated into words such as fighting spirit, stubbornness and endurance. To completely understand how perfect the name describes the product, it has to be experienced. The nicotine level is 20 mg/g and with an amount of about 12,94 mg per portion, this is a product that competes on the highest level with the strongest snuff on the market. The typical taste of SISU snus lies in the characteristic taste of tobacco but is given an extra push with mint. You will notice this as soon as you open the lid. A subtle scent of tobacco mixed with fresh mint will ignite your sense of smell. The second detail you will notice are the white portions, where the cover is softer than usual. The powerful taste of mint comes from crystals of menthol, something that gives a sharp aroma of green mint, and thanks to the menthol crystals the taste will also last longer. The dry portion means that the snuff is less watery, and both the composition and the secretion from the nicotine become more even. 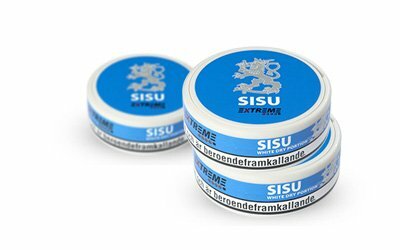 With the SISU Extreme White Dry Portions, AG snus has created a really nice product where both strength and taste come together. It is suitable for people who want a strong snus with a high dose of nicotine and a powerful flavour. Those who appreciate snus with a taste of menthol should definitely try Extreme White Dry Portions - maybe this will become a new favourite to keep in your pocket in the future?